The Burradise crew have been hard at work prepping for this years festival which is shaping up to be jam packed with great music, delicious food and good vibes. We are stoked to announce the complete line-up who of artists for Burradise 2018, with music from West African grooves, blues, roots reggae and spanish fusion. So grab your tix and your dancing shoes and take advantage of our easter early bird special. Children under 12 are Free when with an Adult purchased ticket, with a limit of 2 children per Adult, as numbers are limited. Influential guitarist Moussa Diakité was part of the golden era of Malian music in the 1970s and ‘80s, performing with some of Africa’s best, including Salif Keita and Toumani Diabaté. Since migrating to Australia, he has stamped his mark on the local scene, teaming up with Sydney band Wassado for a dynamic mix of blues, jazz, Cuban and Afro-rock sounds. Hat Fitz and Cara can in no way be mistaken for a dainty duo. They are festival favorites worldwide. and it has been said they pack more energy into one song than most have in an entire career. They embellish impeccable rootsy originals with soulful vocals reminiscent of a time once forgotten. It’s easy to forget that This Way North is a two-piece band. Currently of no fixed address, country girls Cat and Leisha are enjoying life on the road, but one thing is evident their sound: their home is on the stage. Whether in a local dive bar or at a national festival, This Way North plays with more passion and energy than a 10-piece band, drumming up a contagious euphoria. raising eyebrows with their catchy, island flavoured, reggae tinged sound. Early Bird Tickets are $50 for the weekend shows on Friday and Saturday night. The most popular component of previous festivals has been the music – and 2018 will be no exception. Less than two and a half hours from Sydney and Canberra, the coastal village of Culburra Beach is a popular, yet unspoiled holiday destination. 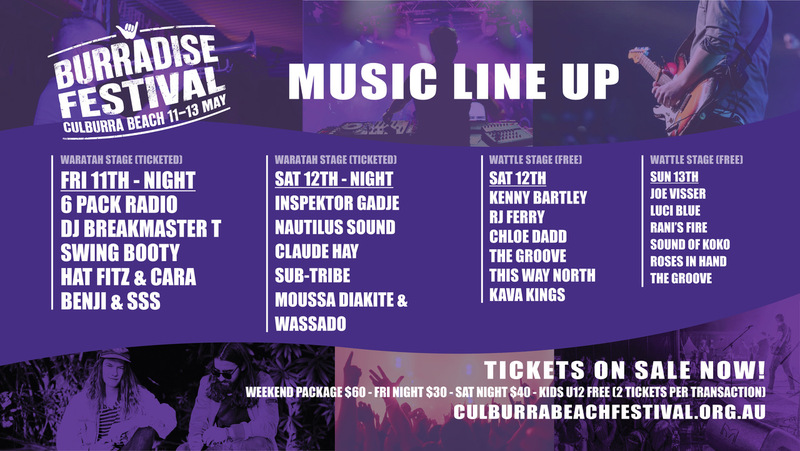 Each year our tranquil village bursts into action for the Culburra Beach Festival – a celebration of music, culture, art, food, craft, surfing and fun – everything that makes Culburra Beach, ‘Burradise’! In addition to the music, there are craft markets, a food extravaganza, art and photography exhibitions, a surfing competition, Jerrinja indigenous culture exhibition and many community activities. Come and explore beautiful Culburra Beach. Bring the family. Treat Mum to a weekend she won’t forget. Burradise – gets ya groovin’. * Burradise is a Not For Profit festival. Please understand that for this reason there will be no refunds on tickets. Thank you.